There is a basic option on the question of whether he collects your money and banks it locally or you collect as you would do in the Commonwealth of Australia. 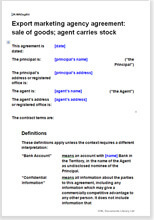 Each option leads to different outcomes in other parts of the document. We deal with all of them clearly and in language your agency people will understand.